Well today went even better than I could have hoped. The clouds rolled in over night bringing temperatures down, yet the rain hadn’t yet begun to fall. 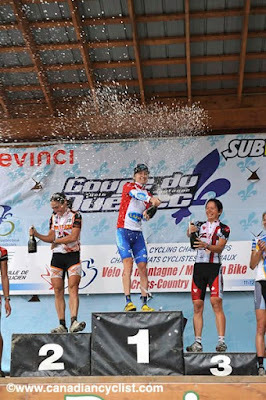 Our nationals course was the same course used for the World Cup held in Saint Felicien, Quebec 2 years ago. It is a fun 6+km loop that takes you over a lot of rocky and rooty terrain. All the climbing is singletrack or switchbacks and there are tons of fast bermed corners. After a good start I was 2nd wheel to Marie Helene the defending national champion with Amanda Sin and Mical Dyck close behind. I took over the lead a few minutes in and tried to open a gap in the singletrack. Everytime I opened a little in one section Marie would claw it back quickly thereafter. I thought I was going to be in for a tight battle all day, but before we finished the first lap I had opened 10 seconds which quickly changed to 25. I raced hard to open the gap and was able to extend it with each lap. Rain started falling and the course was getting more greasy, both on the climbs and descents. Going into the 4th and final lap I had over 3 minutes so descended cautiously to avoid mistakes. The effort paid off as I rolled in for the win 2min 50 ahead of Marie in Second place and my first National Championship win! 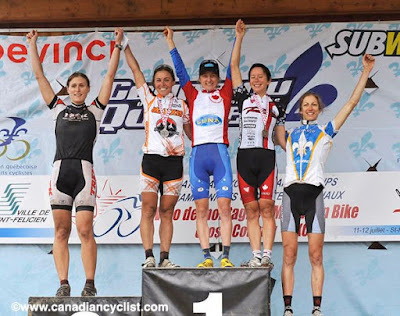 Amanda Sin took the final podim position followed by U23 winner Emily Batty and Mical Dyck. Big thanks to Waldek who flew in to help get my legs ready after BCBR and make sure I was set to battle for the Jersey. Thanks also to my coach Dan Proulx, my husband Keith and Gary Wolfe from Maxxis who looked after my bike and my parents and friends that were there to cheer! It meant a lot for me to have that win with you all there.